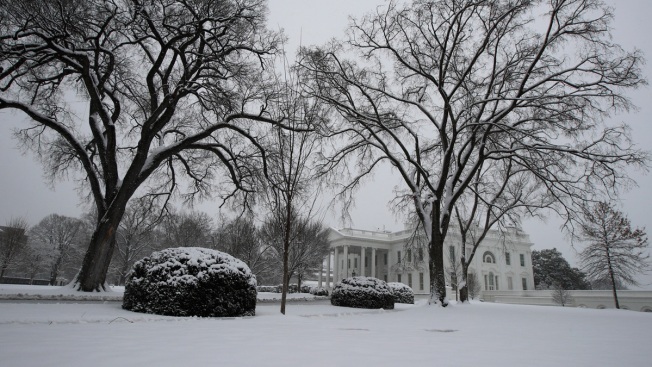 Snow covers the North Lawn of the White House in Washington, Sunday, Jan. 13, 2019. A winter storm brought snow to the Mid-Atlantic region, where forecasters upped their predicted weekend accumulations and transportation and emergency officials urged residents to stay off the roads. For air travelers, the Dullest airport authority subsequently tweeted tips for flying on a snow day, including frequently checking for airline flight changes and packing "patience, a good dose of snow humor & a packet of hot chocolate." Most public school systems in northern Virginia and Prince George's County schools in suburban Maryland said classes would be canceled Monday.